Thank goodness for being in the right place at the right time. Michael Wilson, line crew supervisor at AEP Ohio’s Lima Service Center, wrote in to report on the life-saving efforts of Kyle Jackson, line mechanic A.
Jackson had been working 16-hour days for four days. Due to a fortunate set of circumstances, he happened to be off at 1 p.m. on a Sunday afternoon and left work to go to a friend’s place to relax and swim in his pond. 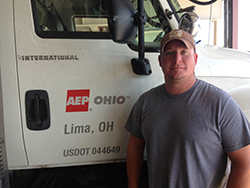 Kyle Jackson, line mechanic A – Lima, rescued a three-year-old girl from drowning. A three-year-old girl had been swimming in the shallow part of the pond with a life vest. At some point while she was out of the water, her brother removed her life vest. The little girl started back into the water, apparently forgetting that she didn’t have her life vest on. While on the shore, Jackson saw the girl out of the corner of his eye. Having small children of his own, he watched her start into the water and asked his friend if she could swim. When his friend replied, “no,” Jackson dove into the water and swam about 30 yards toward the girl, getting to her just as she was going under. Jackson’s efforts saved the life of a little girl that had gone unnoticed by everyone else near the pond. Jackson offered a noteworthy lesson for all. “Never let your guard down with children around water,” he said.